A former financial coordinator for a Pembroke Pines dentist is accused of stealing 237 checks over 18 months that were written by patients and insurance companies and worth $85,353, police said. 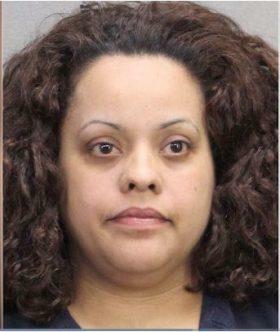 Cynthia Rodriguez, 38, of West Park, was arrested Thursday on suspicion of committing larceny. She had worked for Dr. Hakan Kinaci at Pembroke Pines Dental Associates, according to a Pembroke Pines police report. Discrepancies were discovered in the office’s operating account in January 2014. Rodriguez allegedly claimed to her employer that she was a kleptomaniac and admitted stealing $11,000, which she promised to pay back, according to the report. Rodriguez was fired, and a review of her personal bank accounts found that between July 3, 2012 and December 18, 2013, the checks from patients and insurance companies were deposited to her account at an ATM, where surveillance video showed her at the machine, police said. Rodriguez was released from a Broward County jail Friday on a $5,000 bond, records show. Reached by phone Wednesday, Rodriguez declined to comment.